This side table is a stylish addition to your home. 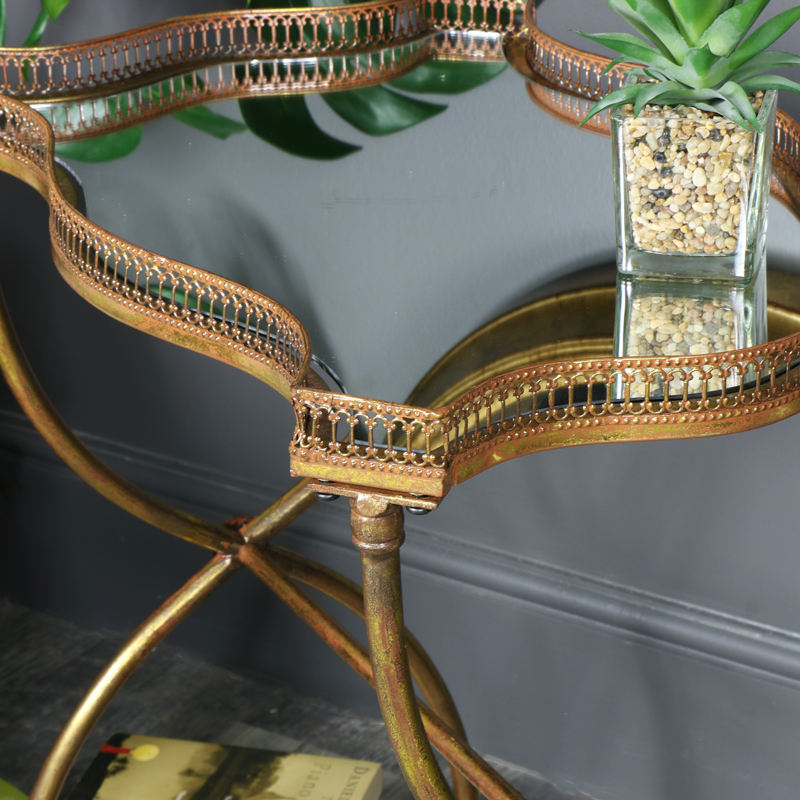 Finished in an antiqued gold finish to give a vintage appearance with a mirrored top. 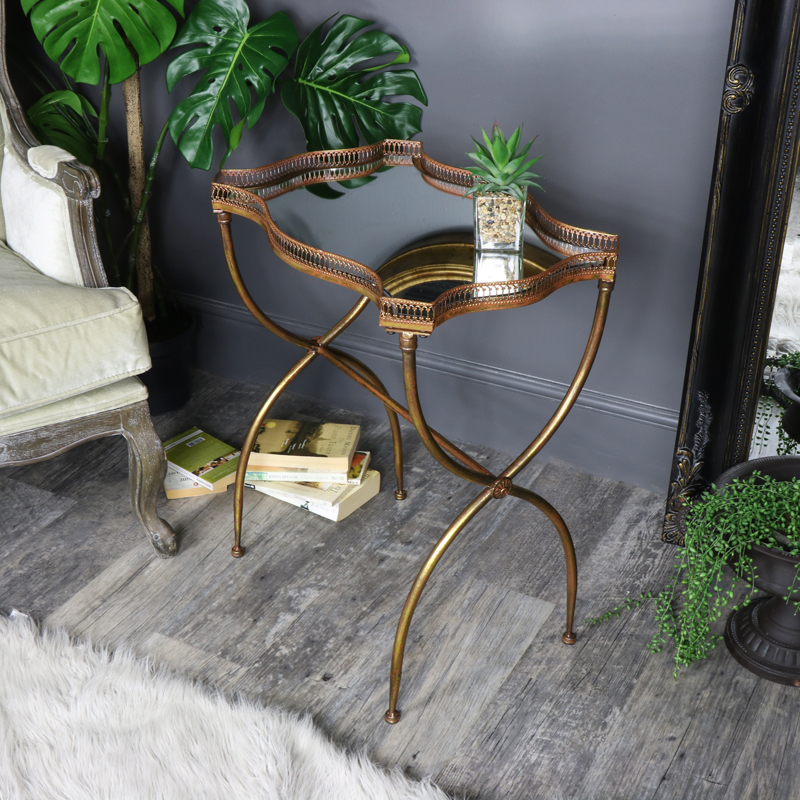 Perfect side/occasional table that will easily suit the living room or hallway. Perfect for a traditional or comtemporary style interior. The mirrored top will reflect the light to create a great effect and make the perfect display table for candles, ornaments or floral displays. This will also make the perfect cocktail table for dinner parties, serve your guests in elegant style. Cutout edging decorates the top of the table to add to the vintage appeal of this piece. This table will also look perfectly at home in the hallway. This side table is a stylish addition to your home. Finished in an antiqued gold finish to give a vintage appearance with a mirrored top. Perfect side/occasional table that will easily suit the living room or hallway. Perfect for a traditional or comtemporary style interior. The mirrored top will reflect the light to create a great effect and make the perfect display table for candles, ornaments or floral displays. This will also make the perfect cocktail table for dinner parties, serve your guests in elegant style. Cutout edging decorates the top of the table to add to the vintage appeal of this piece. This table will also look perfectly at home in the hallway. With metal framework in an antiqued gold finish and mirrored glass top.